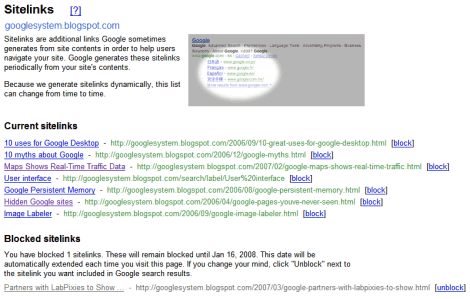 Google Webmaster Tools shows even more information about your site. Now you can find historical data about the most popular queries for which your site appeared in the top 10. You can compare the queries for the last week with the queries from last month or two months ago and find what has changed. It's also interesting to compare the top search queries with the top clicked queries and see if you can improve the title of the page or the actual content. Google Webmaster Tools lets you find data from specialized search engines like Blog Search and restrict it to some international Google Domains, like UK, Canada or India. While some of this data can be obtained using tools like Google Analytics, you can't find the queries that bring you high rankings, but no clicks. In Webmaster Tools, the information is available in Statistics > Top search queries. Special tip: if you download all the query stats as a CSV file, you'll also get data for each subdirectory. For example, I found that my posts from March (that are placed in the subdirectory googlesystem.blogspot.com/2007/03/) ranked well in India for these queries: [google transliteration], [google bookmarks], [google screensaver]. Another update lets you exclude some of the links automatically generated by Google that are displayed in some cases for the first search result. "Sitelinks are extra links that appear below some search results in Google. They serve as shortcuts to help users quickly navigate to the important pages on your site. (...) Now, Webmaster Tools lets you view potential sitelinks for your site and block the ones you don't want to appear in Google search results." Update: Ex-Googler Vanessa Fox has more insight about sitelinks. Not all searches trigger sitelinks. This only happens for searches that Google thinks might benefit from them. For instance, if they think the query has enough inherent intent (...), they figure the listings alone are likely the one-click answer for the searcher. There's an error in the "external links to your site" reported by Google Webmaster Tools, it reports less than the real existent links to your site. Everything else looks good. I know we have a primarily flash driven site, but not sure if we are doing something wrong or it is a google issue. Regarding Vanessa Fox's comment on relevant links. Is there any direction provided by Google on what is considered a relevant link. How closely related does the link need to be in order to be effective?